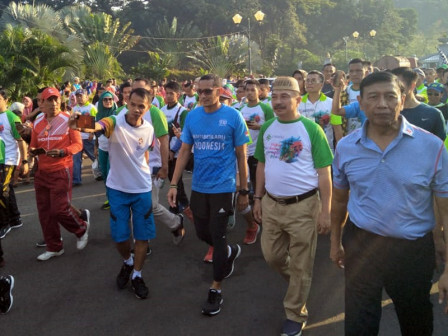 Jakarta Deputy Governor, Sandiaga Uno participates in fun walk and Betawi-Gorontalo Cultural and Art Festival that takes a start from Monas, Central Jakarta, Sunday (7/8).
" This festival also presents culinary from Betawi and Gorontalo combined here and become an attraction where culinary and artistry are assimilated"
The festival presents combined arts creation of Betawi and Gorontalo. According to him, Jakarta is a meeting place for every culture in Indonesia such as South Sumatra, North Sulawesi and so on. With this festival like this, it will increase tourism in Jakarta. "This festival also presents culinary from Betawi and Gorontalo combined here and become an attraction where culinary and artistry are assimilated," he uttered. Meanwhile, Coordinating Political, Legal and Security Affairs Minister Wiranto who also attends in the opening appreciated the festival attraction. "In future, the collaboration of diversity of some areas becomes tourism activities that we will show," he said.